TecTecTec is trying to plant its feet in a market dominated by the likes of Bushnell, Nikon, CaddyTek etc. And the VPRO500 rides a high wave of relevant features packed into a modest budget. The price almost makes you doubt its quality. But this golf rangefinder is really capable of Advance Pinsensor technology, in not one but three modes. It brings some advanced functionality to the table at a highly reasonable price. 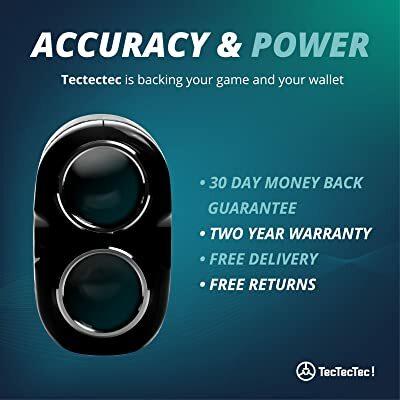 TecTecTec VPRO500 golf rangefinder is refining the science of laser rangefinders which are being increasingly bullied by very capable golf GPS devices like Garmin G7 and Garmin S4. While golf GPS devices are generally lightweight, VPRO500 is not bulky either. It measures 4.1” x 2.8” x 1.61” along the three directions. It weighs only 185g. The grips side at top and bottom carry soft rubberized material for easy hold on it. The shiny black body is pretty to look at but it does betray its low price. The branding is kept to the minimal with the name and ‘Golf laser rangefinder’ written on one side. This is the PinSeeker mode. Here the flag is picked up amongst all the clutter in the background and the distance is displayed. It disregards the distraction behind the flag. VPRO500 golf rangefinder can zero in on the flag even if it is not lined by reflective material or any attention-catching marker. This is the continuous scanning mode of the VPRO500 laser rangefinder. It scans the area within 540 yards around the flag. As soon as sand traps, hazards etc. come into focus, their distances float on to the screen. This gives you a quick estimate of what’s in store for you. This is a feature that mostly only high-end golf rangefinders have. This mode scans for the distance to the furthest targets behind the flagstick. This will give you an idea of how far the ‘distractions’ from the flag. You can use this to get the distance to the target when it’s behind a wooded area. The TecTecTec VPRO500 rangefinder packs 6x magnification with a through-the-lens display. The multilayered optics make it easy to see the target in focus. But the display is not backlit. So you might have trouble reading the distances in low light. All distances from the VPRO500 are accurate with +/-1 yard accuracy. The Autofocus is decently fast and distances update fast when in the scanning mode.Sturdy body: The construction of VPRO500 instills faith its capability to withstand most normal physical shock effects. But it’s not quite as durable as the more expensive specimens from Bushnell or CaddyTek. TecTecTec claims that it is both water and dust-resistant. How do I setup Tectectec VPRO500? The TecTecTec VPRO500 is trying to take on the behemoths in the golf rangefinding field. And it’s succeeding because of its user-friendly workflow. All you need to do is point it and press the Power button for yardage. For PinSensor, press the Mode button and spot the flag. The case that comes with is utilitarian with just a hint of color. This pocket-sized device is primed to be carried around. This golf rangefinder uses a CR2 battery. Do note that this is not rechargeable. But these types of batteries are easily available and can be bought to replace. You should get an entire season worth of work from one battery. VPRO500 is power smart, in that it powers down automatically after a few minutes of inactivity. 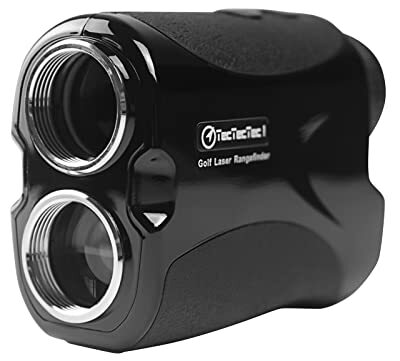 The TecTecTec VPRO500 golf rangefinder is a knight in shining lenses for the golfers who can’t indulge in costly rangefinders or GPS doodads. If you are on a shoestring budget, or you just want a rangefinder to test your GPS devices against, the VPRO500 is t﻿he best ﻿﻿﻿golf rangefinder for you.